* UNTIL 115 AM CST. I have been here since 2001 in the early days so I've seen it all. Not criticizing in any way, and those that know me will understand. Just questioning, merely. Skywarn Certified in 2001 and have watched Matt, Brett, Fred Gossage, etc. grow up. Thanks. It sounds pretty complex. HaHaHa, I feel you! I have mad respect for all of the old members (just kids back then!). I live vicariously now through them! That is why this board is so great. Oh, and has anyone been outside lately? Feels like Spring! Brad Travis at WAFF says the best dynamics are starting to pull to the north of north Alabama into Tennessee. 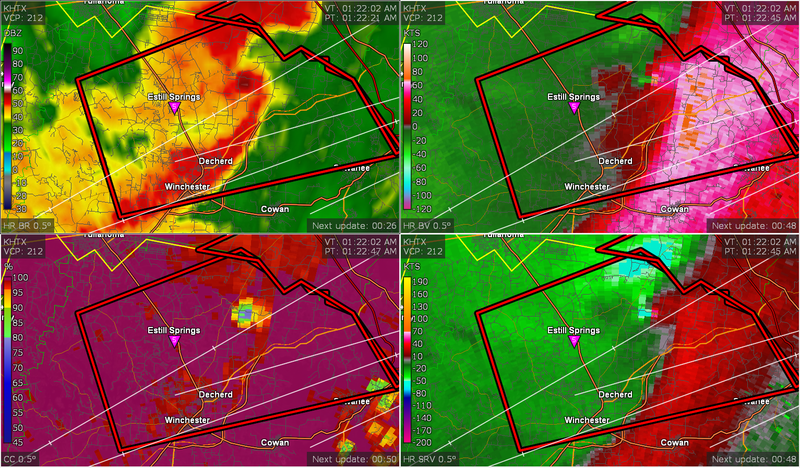 Supercell composit is 8-12 in the same area as well across central al. MOVING NORTHEAST AT 60 MPH. So I take it this is a bust for the Bham area? I wouldn't say bust...the risk was lower for Bham. Wow. That escalated quickly in Franklin Co. TN. Wow Franklin TN. Really wrapped up.